I own the Poynting XPOL-6-10M Antenna which appeared to work well on my Huawei B315 modem on LTE. I now have the Huawei B618-65d and have upgraded to LTE-A. Very odd but is it possible that this antenna is not suitable for LTE-A? 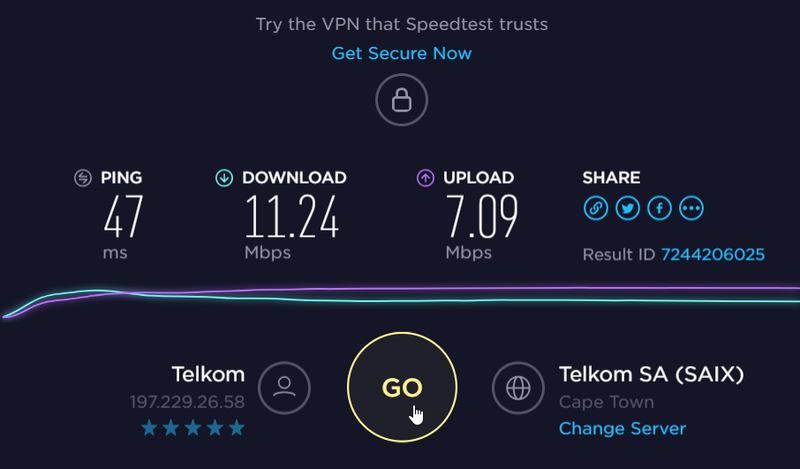 Next I'm going to test with the modem outside where I have direct LOS to the Telkom tower (400m away). I have a suspicion that the tower I'm pointing at is not necessarily the LTE-A variety... LTE-A may be handled by another tower in the neighbourhood. I'll have to move the router around and test. *EDIT* It seems I am latching on to another tower occasionally. I'll have to keep an eye on that! The antenna may be OK if I can figure out where that b748-04 tower is. *EDIT* After some tests it seems the router was in the best place possible in the house for signal which leads me to believe the external antenna is pointing at the right tower, but it's performing consistently better on internal antennas with the external antennas often peaking around 20mbps and internal has on occasion gone over 75Mbps but is consisternly faster than 40mbps. I've resorted to unplugging my XPOL-6 as well, get much better signal with the internal antenna. What Router do you use it with? Anyone know if there are any poynting reps in here? Maybe @sajunky will know something. The guy is a genius. Is your router antenna setting set to external? Yes. Tested on automatic and manual. If it wasn't, I would be getting similar speeds to internal results - it wouldn't be dropping up to 50Mbps when switching. I've got the b618 22d so also using the ts9 adapters. In my case both the 1800 and 2600 bands get better signal strength and quality with internal antenna. I must state this indoors moving the antenna around in circles, couldn't find a direction where it's better. 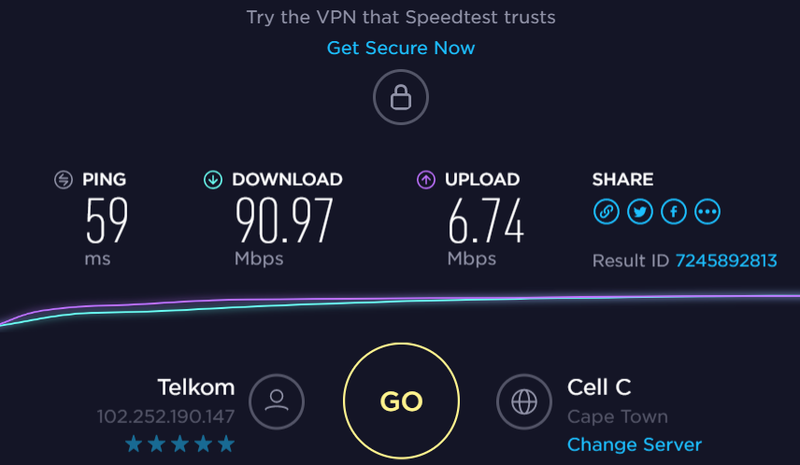 2300 band is for Telkom LTE. 2600 band is for Rain LTE. 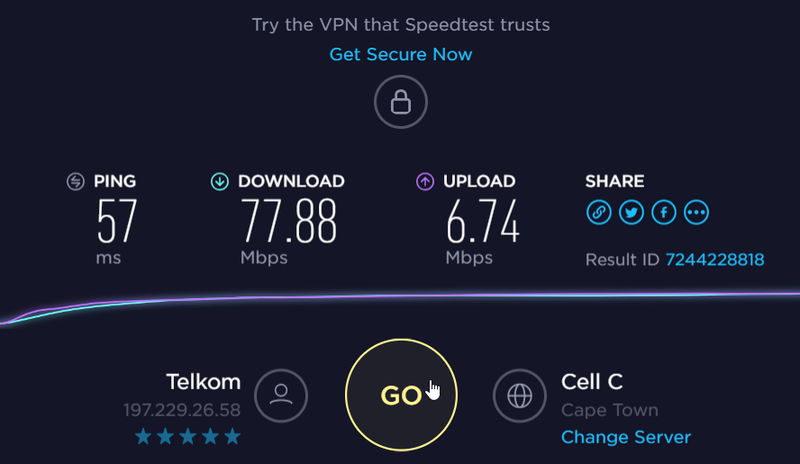 Telkom LTE works on 1800 as well... but is there one that is better for LTE-A is the q. *EDIT* I get nada on 2300 - no connection whatsoever. It's possible the tower doesn't support it, not sure, but it's dead when I force it to 2300. You should't call sajunky by name, as for some unknown reason he is always using obsolete equipment. @manicminer, is any chance you could test router internal antenna outside, next to XPOL-6? 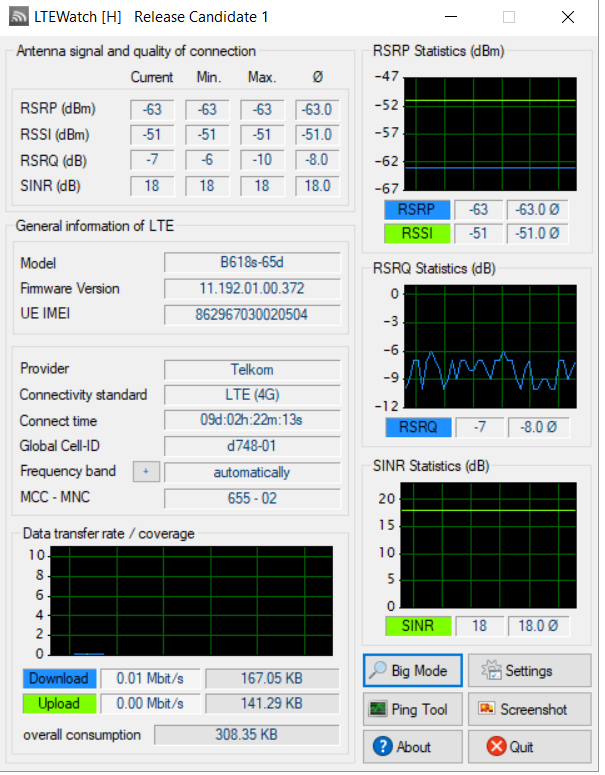 Secondly, what happens if you force 2300MHz band on B315s-936? Maybe tower is capable, but a new router has problem? Remember if you use E5186 Toolbox, do not use frequency selection on the main tab, it is only valid for E5186s-22. You must do it manually. If you have used dropdown compbo box before, you should reset router to defaults in order restore default frequency set. This comment do not apply if you force frequency band from the Web browser. 1. You have extraordinary and strong signal inside the house. If you add another 8dBi (considering signal loss on the cable), receivers can simply saturate introducing harmonic distorions to the signal. I am not a specialist in the area to say which parameters would be indicative of this situation (if any), but if it happen, I can say it for sure, it would affect negatively demodulation process. 2. With such strong signal and excellent SINR, tower is trying to switch to the highest coding scheme with 4*4 MIMO. Your antenna gives only two decorelated signals suitable for 2x2 MIMO. It means that you are losing 4x4 MIMO, as you can't receive it. #2 alone would lower throughput only by 50%, so perhaps there is a combination with #1. Additionally: With all previous radio technologies, signal reflections inside the house are lowering ability to decode signal. However I found the MIMO technology can actually benefit from reflections. Reflections create spacial diversity (which is essential for MIMO operation), it may be not present at LOS (depends how signal is formed). In summary, you should consider external antenna only when signal strenght or signal quality is low, it is none in your case. Yessir! Have been planning to do this - will do it in a few. Unfortunately that has been sold. Remember if you use E5186 Toolbox, do not use frequency selection on the main tab, it is only valid for E5186s-22. You must do it manually. If you have used dropdown compbo box before, you should reset router to defaults in order restore default frequency set. This comment do not apply if you force frequency band from the Web browser. Thanks for that tip - I'll reset to defaults. I tried it once. I don't use E5186 Toolbox - I'm using LTEwatch-H which recognizes the model. I did use the dropbox on that app though at one point. This is possible I guess, though it seemed to improve things on my prior B315 (on LTE not LTE-A). I suspect this is what I'm experiencing. The modem is right near the wall on the side of the house facing the tower. Anyway, going to test outside quick. I packed up, came back inside, connected up to the antenna, reset to defaults and tested again and no go. 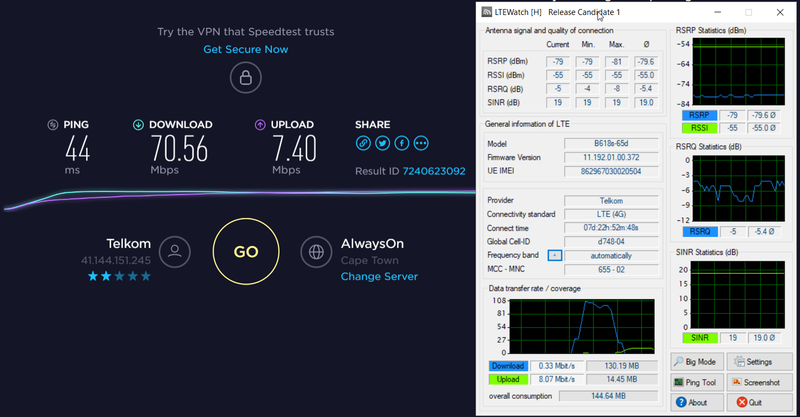 2300Mhz is not connecting at all. The antenna is also losing about 30+ Gbps, so around 20-30 mostly on the 20 side. My conclusion is that I probably don't need the antenna and probably shouldn't be using it given that I am getting a pretty good signal as-is. Before I put it up for sale though, I'm going to test the T9 / SMA adapter with my multimeter. I must admit I don't like the T9 connectors much. I'd prefer something that either screws in or clips in with a 'click'. One last q... what are the RSRQ stats there? They look worse with the unit outside with clear LOS than inside, or am I misreading? Also SNR appears (very) marginally worse for some reason. On the roof you pickup different antenna segment of the same tower. Signal strenght is improving, guality is better but speed do not increase. It means this tower is giving a maximum, nothing better you can achieve on 1800Mhz. Thanks, I'll give that a go. 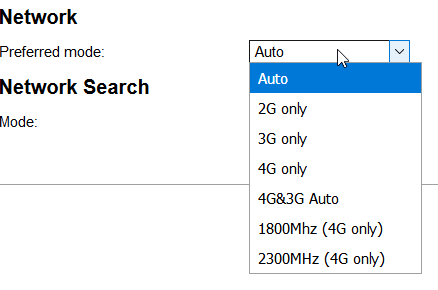 What about the drop-down in the web UI of the modem's own firmware? I'm using that to switch to 2300 and getting nothing. Should I be aiming for another frequency? Maybe just coincidence. I'm going to test more in a bit - have a kiddies party to go to lol. It may work with default IP address, reset router to defaults. I also got such error without a valid SIM card. I tried resetting to defaults and had the same issue on 192.168.8.1 with user=admin and pass=admin.